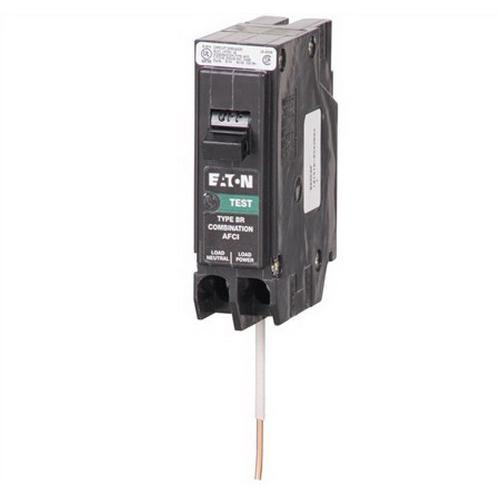 Eaton Type BRC 1-Pole combination arc fault circuit breaker is rated at 15-Amps and 240-Volt AC/250-Volt DC. Interrupt current rating of this circuit breaker is 10-Kilo-Amps. It has non-interchangeable LI thermal-magnetic trip that offers overcurrent protection for sensitive equipment. This 1-Phase plug-in mountable circuit breaker with quick-connect neutral connection, accommodates copper/aluminum wire of size 14 - 4-AWG. It measures 5-Inch x 3-Inch x 1-Inch. Full length neutral bars in the circuit breaker provide over 300% neutral capacity while enhancing installation flexibility for the installer. Solid-tip stranded neutral wires in the circuit breaker provide quick-connection to full length neutral bar. Circuit breaker with backed-out neutral screw, allows for quick-connection while terminating neutral and ground wires. It incorporates standard LED diagnostics to provide best troubleshooting technology. Circuit breaker is UL listed.